Without a set of principles, theories, and proven methods design critique would be meaningless. It would be dependent only on personal tastes and provide nothing concrete to pass onto the future. In graphic design we know that kerning and leading are important in typography because it leads to legibility. We know that colors should not vibrate together because it makes shapes hard to distinguish from each other, or that proper perspective in a drawing leads to a sense of realism. We know quite a bit about what works in visual art, but if you were to ask what truly works in a football uniform and why, you might be at a loss for words. Certainly, we all know what we like but the thing with good design is you don’t always like it. I belive knowing the difference between “I like it” and “it’s good” is the first step you have to make in critique. So how could one critique a football uniform while setting aside tastes and opinion? Can that even be done? 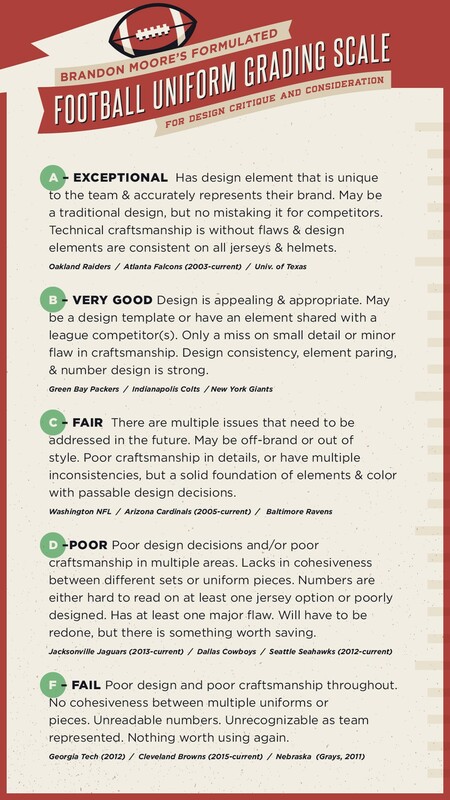 Im not 100% sure, but I’ve attempted to build a grading scale for football uniforms specifically, though I believe this could carry over into other sports uniforms. I made this scale to try and elevate the criticism of uniform design beyond “I like it” or “don’t like it” and hopefully provide a better conversation point in the discussion of uniform design. I don’t claim this to have any correct answers, this scale is built upon what I think makes a good uniform though my own experiences, education, and research. Take it with a grain of salt, but if anyone ask me “what do you think of this uniform?” I refer back to this scale. The grading system starts with some non-negotiables and design principles which are listed below. These points built around why a uniform exists in the first place and if they are not followed, the uniform does not do what it is needed to and isn’t much of a uniform at all. Non-Negotiable 1: Distinguish Team vs Team — During a game the two opposing teams must be easily distinguished, even from the top of the stadium and high TV angles. This means a team’s uniform must be different in color from most teams in the league. 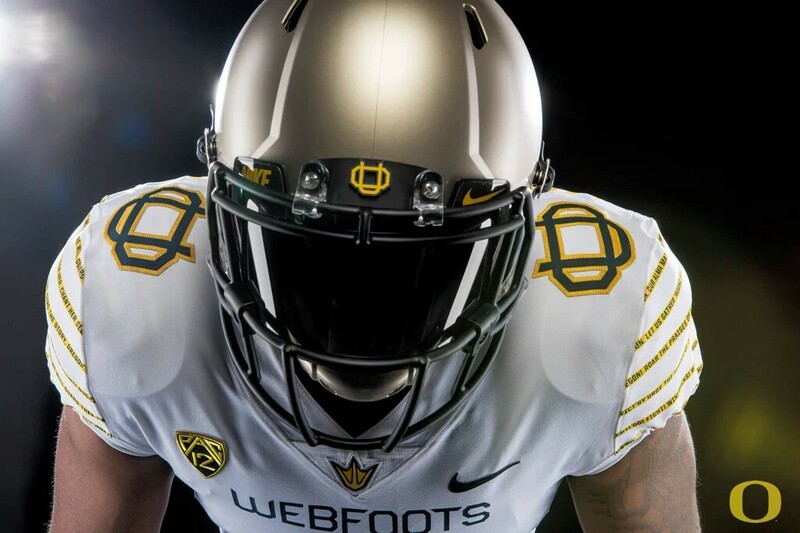 If 2 or more teams share a color palette, it is best to include either a helmet, pants, or sock option that will further separate the teams; don’t just rely on jersey color. (It is up to the teams to decide what is appropriate to wear for each game). Non-Negotiable 2: Distinguish Player vs Player —Players must be easily distinguished from each other by number design from the All-22 angle for coaching purposes and TV broadcasts. The focus of the uniform should always be the number. Stripes, logos, and all other elements come secondary to the player number. 1. Materials and colors must all pair well and with consistency. It is best to pair a matte helmet shell with a matte face mask, or a gloss shell with gloss mask. Make sure different materials match each other in color. 2. All shapes/elements must pair well. Careful with pairing rounded and sharp elements. 3. If using a pattern or texture, make sure it is consistent in all applications. Additionally, I’ve built an extended list of my own principles I believe makes for an even stronger uniform. Some of these tend to be more taste inspired, which is why I don’t include them in the Grading Scale. Identity only begins on the field, don’t forget about apparel and retail. Every team needs 1 thing that is their own and a signature color palette is best. Traditional visual language of football will always be appropriate and stylish. This includes: helmet stripes, sleeve stripes, block letters/numbers, gray face masks, black cleats, and TV numbers. Gray face masks usually work well with any design, unless the design is intended to be modern and forward thinking. Gray masks reflect old school football. Avoid using only traditional or popular elements. The New York Giants and Buffalo Bills uniforms of the 1990s appear generic because of this. Sewn and embroidered elements give a higher quality appearance than screen-printed. NFL uniforms are worn by professional men, some up to 40 years old. The designer should always keep this in mind and design accordingly. Design with the body in mind — curved shapes might be better than straight lines. Make helmet design as flexible as possible, accounting for all helmet shell designs a team carries. All the jerseys in a team’s set do not have to be of the same design, but they should all feel as though they belong to the same team. Avoid number design and outlines that complicate the space in number forms or cause them to vibrate visually. Use 1 color numbers whenever possible. Try to only use outlines and shadows on numbers when the number/jersey value isn’t high enough in contrast to separate them easily. Note: sometimes stroked numbers will pair better with other elements (logos, stripes, etc) if they are detailed or stroked. Ideally, socks should have stripes. A logo is part of the team identity and part of the uniform. A bad logo will ruin a good uniform. Rhythm is an overlooked design principle. The design must flow and have consistent rhythm from helmet to cleats. Reliable color combinations: ABAB, ABCB, AABA, ABBB. (note: NCAA uniform uses either short white or black socks.) These are not the only combinations that work well, but they are almost always great. Do not repeat logo or number on jersey sleeve if it already appears on the helmet. A football uniform should always appear “tough”. Football is not a gentleman’s sport. Design for environment. Contrast in snow, a poorly lit dome, matching autumn colors, etc. Know where the uniform will live. Black, white, and metallic colored helmets are never a bad choice. You can use more than 1 stripe pattern, but use no more than 2 color alterations of the same stripe. Any more and the it kills the unity of the design. Place front numbers high enough so they are displayed on the chest. No belly-numbers. Avoid color fills (filling in a uniform panel with a contrasting color). They appear lazily designed and often highlight ugly seams or uniform elements. Thoughts & opinion on graphic design & creating it.